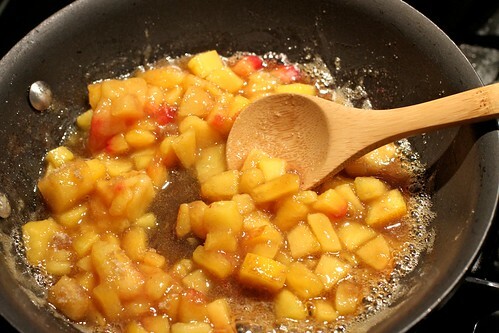 In a medium saucepan, heat the milk gently with the vanilla bean, vanilla sugar and salt. Bring to just below a simmer and keep hot. In another, heavy saucepan, melt the butter over medium-low heat. 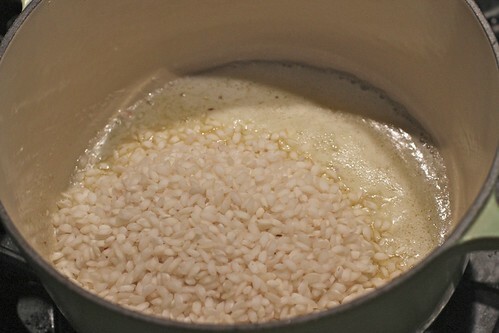 When the foam subsides, add the rice and toss to coat. Toast the rice for a few minutes, until the grains start to look slightly transparent. The heat shouldn’t be so high that the rice starts to brown. 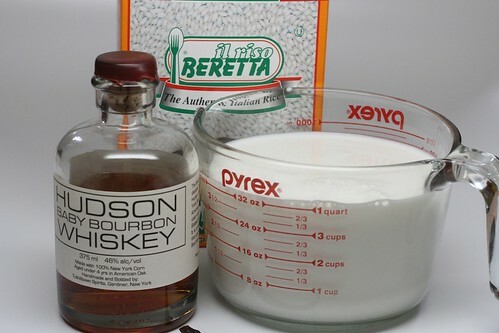 Stir the boubon into the rice; stir vigorously until the booze is all absorbed/cooked off. Start adding the hot milk into the rice, one cup at a time. Stir well after each addition; let the rice simmer, stirring frequently and adding more milk when the last batch has been mostly absorbed. 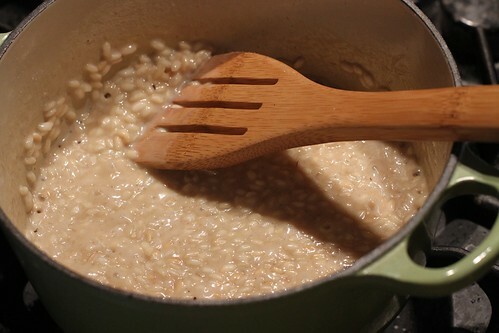 Start tasting the rice for doneness after about 15 minutes of cooking; you may not need all the milk. 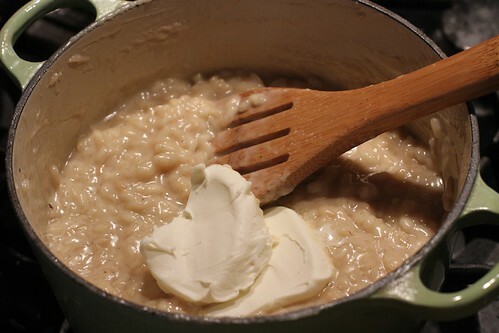 When the rice is done – it should be nice and creamy – stir in the juice of half a lemon and, if you’re using it, the mascarpone. Eat hot or cold, what do I care? 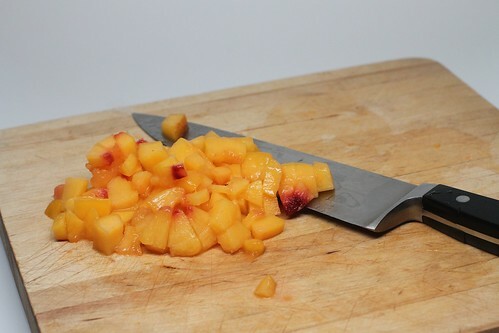 If you’d like, make a quick peach compote while the rice simmers – dice a cup of peaches and toss with a few tablespoons of brown sugar over medium heat until the sugar and peach juices combine to make a sauce. 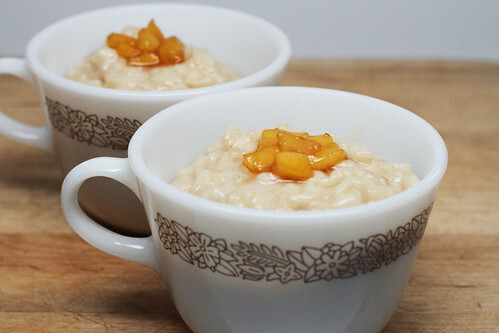 So this is basically a dessert risotto, based on the cooking method. Huh! I bet that is super effing delicious. where did you get that adorable little bottle of bourbon?? where did you get that adorable little bottle of bourbon?? I love it. liz, yup! that’s exactly it. madeleines, it’s from tuthilltown distillery in NY.